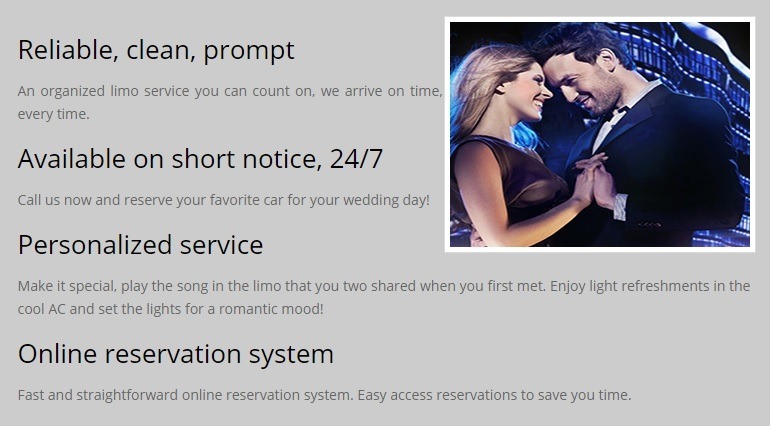 On that special day, you want the best wedding wedding limo rental service you can find. There are no room for mistakes or errors, and Nationwide Chauffeured Services is one of most reliable transportation companies in the entire country that is ready to serve the bride and groom on their special day. We also provide some of the safest and most reliable drivers in the industry. Our chauffeurs go through regular safe driver training and drug testing to ensure they are safe behind the wheel. Our vehicles all contain the latest GPS navigation equipment and with the knowledge are drivers possess about the area roads, they can reach their destination on time, just about every single time. As a wedding limo service, we have more than 20 years of experience providing transportation for these special moments in life. Everything should be perfect on that special day, so when you want the best limo and chauffeur to create the VIP experience for the newlyweds, call Nationwide Chauffeured Services. Where available 24 hours a day, 7 days a week. The most important day of your life should be perfect, so hire the finest Limousine Service Northern VA can offer. All of our classy Wedding Limousine Service are in pristine condition and our chauffeurs are reliable, patient and polite. We have a large fleet of well maintained and dependable vehicles that are immaculate, so your dress stays stunning all day. We are punctual and can provide transportation not only for the bride and groom, but for groups to and from photo shoots as well. Our Wedding Limousine Service professional chauffeurs can accommodate your every need on this special day; this will be a day to remember for the rest of your life and we understand it’s crucial for everything to go as planned. Experience comfort, luxury and arrive in style with our Wedding Limousine Rental and DC limo service. Celebrate with champagne and wave to your friends and family through the sun roof as you two cruise off into the sunset. Our considerate chauffeurs will take care of you, your friends and family and help make it the best day it can be! Call Now at 800-942-6281 for Cheap Wedding Limo Service.